So, the first thing I should probably do is describe a fibula (singular). Think safety pin without the safety. Fibulae (plural) appear on the scene by about 1,000 BC in Mesopotamia, and we still use their descendents today, in the form of kilt pins and safety pins. Pre-1600 fibulae can be made of bronze, iron, silver, or gold, They can generally not be made of lead or tin because these metals are too soft and will break when flexed repeatedly. Fibulae can be plain and functional, or large and ostentatious. This gold Etruscan Fibula shows just a hint of the type of complexity and beauty that was put into crafting some of the ancient fibulae. And this winged fibula from Panonia (an area that bordered the Danube) is an exquisite example of the jewelers art. But on a practical level, most fibulae were relatively plain and functional. This picture shows a selection of fibulae and pins that I own. The left hand column is a 1500’s pin, a Celtic fibula (3rd to 2nd c BC), and a Celtic fibula (from Yugoslavia 1BC to 1 AD). The large dress pin on the left is a Roman silver hairpin pin (found in Yugoslavia 1st to 3rd c BC – and yes, that is a duck on top), and the large pin on the right is a silver reproduction Viking dress pin that I use for closing my shawl. The right hand column contains reproduction pieces from The Treasury. Three sets of two: dress pins – 1200’s to the Victorian Age. The top set are small brass pins, the middle are large brass pins, and the bottom are large nickel silver (looks like silver). The bottom of the column is two small fibulae, one in brass and one in nickel silver. And what about dress pins? I personally believe that dress pins are probably one of the oldest types of closures that were used by mankind. A large thorn, a sharpened stick, and eventually sharpened pieces of metal were used by almost every culture to close a cloak, hold hair in place, or close a more complex garment. The size and complexity of construction of dress pins varies dramatically depending on the available materials used, and the technology available to the maker. Earlier dress pins were generally (always a dangerous word!) larger, usually three to six inches long. Later period dress pins could be much smaller, often only 1 to 1 1/2 inches long, but larger specialty dress pins, in the form of hair pins and hat pins are still in use today. And then there are the “miscellaneous brooches”. Different shapes, different sizes, different metal alloys, and we often find them out of context. What were they used for? Were they decorative? Were they functional? Were they both? It is known that in Roman times there were specific large brooches awarded to certain men of rank. This bow brooch, which is a specialized form of fibula, is an excellent example of this sort of brooch. And some of the huge ring brooches that we find in Scotland and Ireland, certainly fall into the “I am obviously important” display category. This brief article on the Tara Brooch has a couple of great pictures. There are also tons of brooches shaped like animals, hearts, flowers, and geometric shapes, just to name a few. But going back to our possibly long forgotten original point – most don’t lay flat, and while they may work well on an outside layer of clothing, they don’t work well on an interior layer. 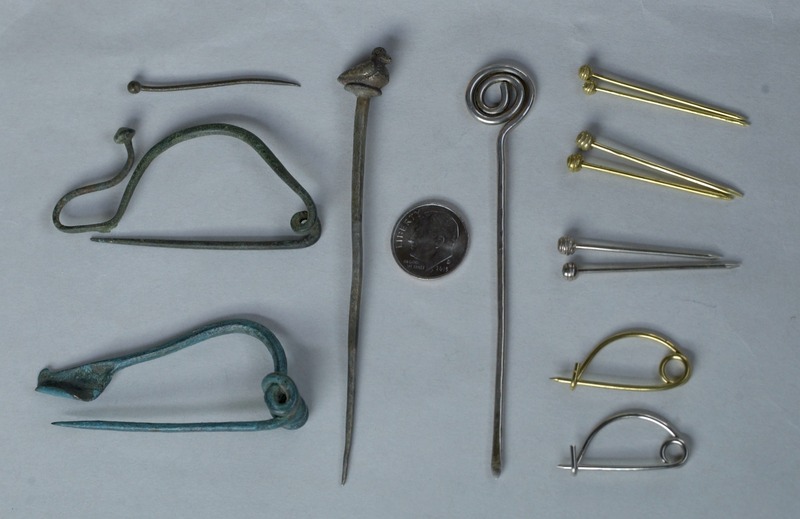 This entry was posted in Archaeological Finds, Dress Accessories, Jewelry and tagged ancient brooches, brooches, dress pins, fibula, fibulae, hair pins, hat pins, Safety pin by Eirny. Bookmark the permalink.